With the µ[mju:] 300 Digital you get it all: The latest technological innovations in a sleek, weatherproof, full-metal body for great performance and a stylish design. A precision 3x optical zoom lens and high-quality CCD with 3.2 million pixels ensure clarity and sharpness. And whether shooting in full-auto mode to capture the scene quickly or using one of the camera's special scene modes, recording panorama shots or short movies, this model matches your lifestyle while guaranteeing first-class results without a fuss. 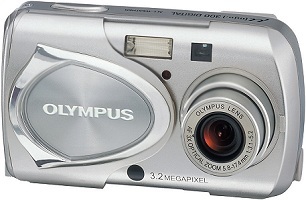 The µ[mju:] 300 Digital uses the xD-Picture Card.